"Science attempts to explain the world in which we live. It provides technologies that have had a great impact on our society and the environment." For decades, bicycles have been able to power their lights from a dynamo, but these were only any good if you were moving: stop at traffic lights or junctions and your lights go out! Also, dynamos powering ordinary incandescent bulbs make it harder to pedal, making it harder work... of course, it has to be harder as you have to expend more energy as you transfer energy to the lights. Lighting technology has seen a big change in recent years and it's a change which will keep coming - we're talking about LEDs here. More efficient even than CFLs, LEDs are set to go mainstream over the next couple of years. All bikes sold in the UK have to have reflectors fitted to their pedals. These really are great, because your feet move up and down, so drivers behind you see a blurring, flashing orange light each side of you moving up and down! But when you stop at junctions, you don't keep moving your feet. So there's a danger you won't be seen. And what about from the side? You could add more reflectors, but how cool would it be to actually have your own source of flashing light? That's what Pedalite have done - they've cleverly added a small dynamo into a pedal, fitted an energy-storage device (probably a capacitor, rather than a cell) and added three super-bright (but importantly, high efficiency) LEDs per pedal: a white one at the front, yellow at the side and red at the rear. Since energy is stored when pedalling, the lights continue flashing for several minutes on their own. This is more than ample time when stuck at junctions, so you should be much safer. And because the LEDs demand much less energy input than ordinary bulbs, the dynamo resistance is absolutely minimal - you simply don't notice the difference when pedalling. Another massive advantage is in the summer months when you get caught without lights. Instead of having to worry too much about breaking the law (or perhaps worse, getting run over! 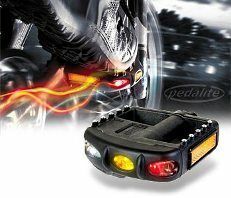 ), the pedal lights are bright enough on their own to make you visible from all angles. Even in the depths of winter, additional lights on your pedals is an advantage when your main lights have battery failure - consider them a fantastic back up to your main lighting system. The pedals have only one downside: you have to flip them up the right way or the red LED ends up forwards and white behind. It's easy to get used to this and the metal stud grips offer superb grip on most shoes in all weathers. After a few days using them, we found the solution - pedal half a turn with the other foot (since the pedals stay in position due to the dynamo) and - da da! - the other pedal is the right way up! These pedals are a terrific innovation that will make anyone who uses them much safer on our roads. As a result, we are delighted to award Pedalite pedals the GCSE.com award for safe technology.